A People Set Apart - The WHY of Israel's election remains a mystery, but the certainty of it is clear. A Land to be Possessed - Such a promise, given to nomads who had no land, generated great excitement in Israel's camp. Ethnic Separation - Any and all things which would encourage an assimilation of deadly pagan principles into Israel's way of life could only lead to a future devoid of blessing. Separation Within the Family - Israel's destiny was too majestic to permit it to be placed in the hands of the irresponsible. A refining process took place within the family itself. The "spiritually stunted" were separated from the spiritual giant. Geographic Separation - The chosen family did not arrive in Goshen by accident. Here this seed of an emerging nation could live at least partially separated from a godless world. So That Israel Might be a Blessing - Land, seed, and separation must always be seen in their relationship to blessing. Land so Israel could grow into a great nation bent on holy purpose. Descendants as multiple as the stars so that God would have a multitude of human arms to carry out His ministry on earth. Separation was instituted so that a chosen people might become what they were designed to be, a blessing. Figure sitting on rock ledge (lower right) - Israel. Ring encircles figure - Israel is set apart by God to carry out a unique destiny upon the earth. Figure surveys scene in misty clouds - Israel contemplates some of the promises, disciplines, and circumstances which belong to its future. Land scene (lower left) - Covenant entails promise of a land. Kingdom scene (middle left) - Covenant entails promise that seed of Abraham will multiply, and Israel will become a great kingdom. Small figures encircled by ring (upper left) - Israel is called to maintain ethnic separation. Small figure separated from circled figures (upper left) - God brings about separation within families to insure fulfillment of the destiny. Circled figure and land scene (lower left) - Divine circumstances lead Israel to geographic separation. 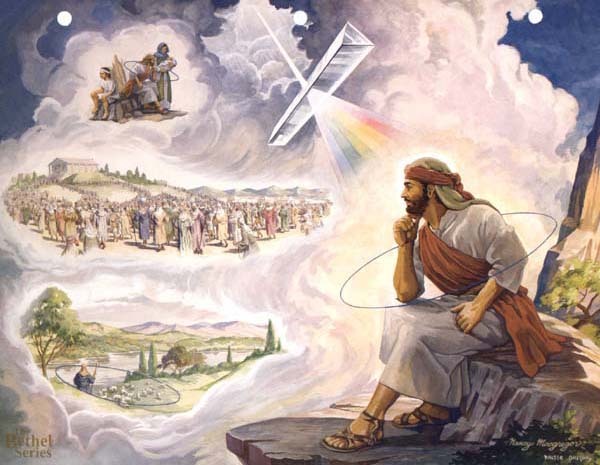 Prism symbol - Land, kingdom, and separation concepts: all are understood to be means to an end which will permit Israel to become the blessing which it was called to be.